In case you weren't aware, Zoya pretty much knocks it out of the park with every single nail polish collection they create. And, true to form, the Naturel Deux (2) Collection (which launched a couple months ago) is no different. The six polishes in this collection take the idea of neutral and spin it on its head, making it become something completely new and different (and, of course, completely gorgeous). Read on to see all my swatches and thoughts on this collection. The Zoya Naturel Deux (2) Collection is, as might be obvious from the name, the second in the Naturel realm. You may remember my purple ombre manicure from the first collection, which remains one of my favorite manis to date. Naturel Deux (2) takes the 6 colors from Naturel and deepens them ever so slightly. I must admit that when I first saw the collection, I wasn't necessarily blown away -- the colors were pretty, but I wasn't sure how different they actually were from the first collection. Well, I take that back after actually trying the polishes. They're richer and have a bit more depth, and all six are absolutely perfect for fall. Zoya Naturel Deux (2) contains three browns and three purples, all of varying tones from light to dark. All of the colors in this collection have a creme finish. I used two coats for each with no base or top coat. All applied easily with no streaking or dragging. Spencer is a pale camel. Honestly, it just makes me want to go out and buy a Burberry trench coat. This is one of those polishes that didn't necessarily impress me in the bottle, but once it was on my nails? YES PLEASE. I love how it pops just enough against paler skin. Chanelle is described by Zoya as toasted almond -- and I think they got it exactly right. This is another one of the colors I wasn't too sure about before I put it on my nails, but WOW. What a beautiful neutral shade. Emilia is a rich dark chocolate. Basically, it just makes me want to drink hot chocolate every time I look at it! I tend to have issues with darker colors, especially with trying to keep them off my cuticles, but this one applied like a dream. Madeline is described by Zoya as a muted rose, but I think it's more mauve. Any way you slice it, though, it's GORGEOUS. I'm a sucker for pale purples (this is actually the color of my bedroom walls) and I'm going to be wearing this shade pretty much from now until the end of time. Aubrey is a deep mauve. This is one of my favorites in the collection. I think it easily transitions from cooler to warmer temperatures -- what a great pedicure color this would make! I'm pretty obsessed with the richness of this color. Marney (or Marnie -- really not sure which, actually, since my bottle says the former but Zoya's website says the latter) is a deep warm plum. In other words, it's stunning. This would look especially perfect during the winter on short, rounded nails. The bottoms of all the bottles from the Zoya Naturel Deux (2) Collection. 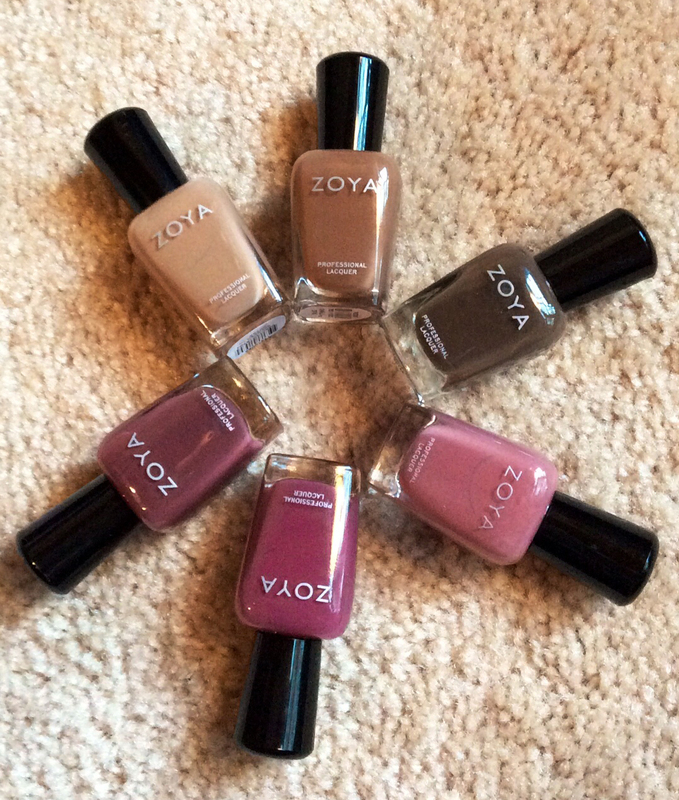 All of the nail polishes in the Zoya Naturel Deux (2) Collection retail for $9 each. You can also buy the sampler of all 6 nail polishes for $54. The collection is available at zoya.com. I am totally loving your blog. Cool reviews you got there. =) I've seen a Zoya Naturel Deux (2) colection at my friend's house. And from that moment, I fell inlove with Aubrey. Just like you, I love purple so much. I even have 10 purple dresses in my closet. Haha. I also like the Purple Passion: Zoya Naturel Collection Ombre Manicure.